Beam Splitter during a December 5, 2018 performance at The Lab, San Francisco. TRADITIONALLY, A VOICE SINGS while accompanied by an instrument, but the members of Beam Splitter and Voicehandlertwo electro-acoustic improvisation duos hailing from Berlin and Oakland respectivelydispense with that custom in favor of offering a conversation between sounds. There’s no adhering to conventional roles of harmony and melody, and the results offer balancing acts of sound-grammar pointillism and textural landscape; when the groups shared a bill at The Lab, they offered a study in conceptual contrasts as well. 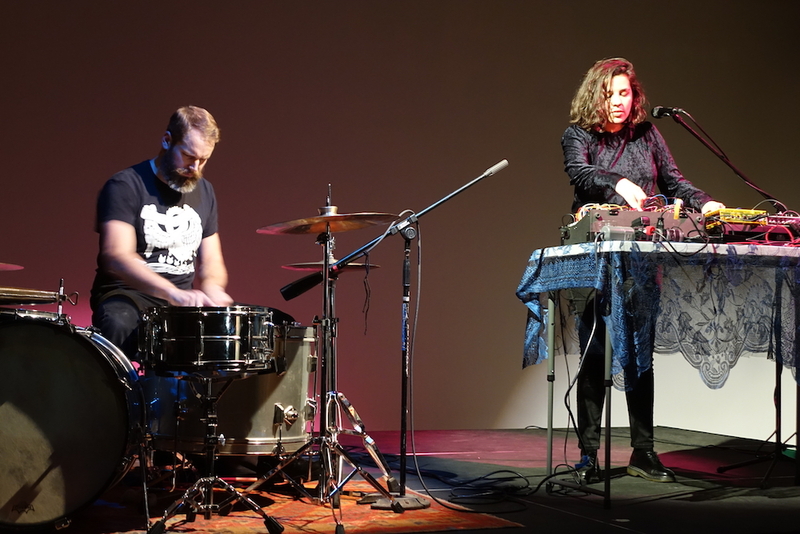 The first set featured VoicehandlerJacob Felix Heule and Danishta Rivero Castrowho have produced two excellent recordings covering a range of sonic activity. Song Cycle, their 2015 release, is a collection of short, highly controlled compositions that the two developed over a period of a few years. Their subsequent release on the Humbler label, light from another light (2018), expands their vocabulary, opening up a spectrum from angsty shouts to ambient cinematic soundscapes. In performance, Heule creates percussion textures that read like shifting terrains, traversed by Rivero Castro’s high-wire vocal act. Heule has spent decades scraping and rubbing objects along the surface of his floor tom. He’s a Wisconsin native who has lived in the Bay Area since 2003; it’s possible his California residency has influenced his ability to conjure seismic activity with low-pitched membranophones. Rivero Castro meanwhile erupts with embodied urgency, responding to his textures with primal ululations while crafting a palette at once virtuosic and raw. Her voice has the ability to surf Heule’s tidal waves of sound; in doing so she invokes the way any one of us might respond to shifting emotional and social turmoil. While Voicehandler captures earthy, tumultuous territories, Beam Splitter forges a sonic depiction of urban density, a sea of diverse voices and personalities. During their set, they leapt into action with fierce momentum. Their sound is rich with extended technique, their distinct voices channel breath with precision and a fluid display of volume dynamics. 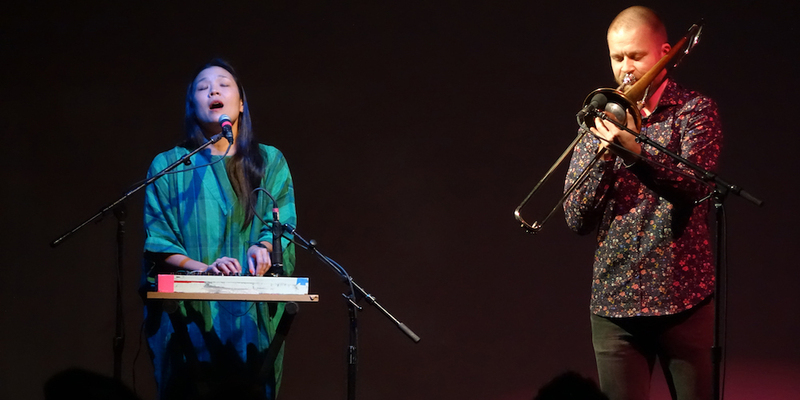 Connective tissue emerges from the music’s motion: the rapid-fire 16th-note pulses from Henrik Munkeby Norstebo’s trombone align and trigger Audrey Chen’s glottal utterances (and vice-versa). Both artists utilize close-mic-ing, offering microscopic clarity. Voicehandler during a December 5, 2018 performance at The Lab, San Francisco. The duo intermittently used live electronics to add shimmering atmospheres, porous containers for their tightly wrought dialogue. After several minutes of intense activity, the musicians transformed a fervent exchange into layers of pianissimo drones littered with muted fizzles. This section, which was fairly short compared to the long-form improvisation preceding it, could have extended or recurred to balance regions of chaos with those more serene. They returned instead to familiar territory from the opening section, where Chen’s voice was free to demonstrate her astonishing range. There are sixteen moving parts to the vocal mechanism in the human body, and each must be employed carefully in order to shift between the types of sounds a singer produces. It takes remarkable control to perform Chen’s volume, color, pitch and timbre, extending from whispered utterances in subwoofer territory to ear piercing squeals; her ability to warble in shuddering cascades is particularly impressive. Whether you’re listening to the band live or on Rough Tongue, their 2017 release on Corvo Records, Munkeby Norstebo’s sound vocabulary is an excellent counterpart to Chen’s phrases. As she fluctuates wildly in terms of pitch, his flutter-tongue pulses, growls, and white noise focus on single notes. Voice and trombone may have radically different constructions, but each is similarly a tube of air that projects sound when it strikes resistance with a vibrating object. Perhaps it goes without saying that an extreme level of trust and familiarity must be established in order to respond to your partner in ways that appear as effortless as these groups make it seembut it’s still important to note that both duos are romantic as well as creative partnerships. They collaborate, travel across borders of state and nation; they offer support and depend on one another. As in all relationships, the ability to communicate honestly is essential, and as artists these human beings offer the fruit of their endeavors as an example of what is possible when people strip away fear and interact with integrity and courage. In a matter of moments, each duo was able to establish an unmistakable sonic identity for the audience, leaving a deep impression long after the end of the concert. At the outset of this piece, I’d intended to compare how each band represents its artistic community. But I decided against that angle because in reality contemporary improvisation is more concerned with shattering borders than establishing them. This music isn’t about maintaining a region, it’s about freeing performers so that they can expand the possibilities of self-expressionfor themselves, and for their listeners. ­Beam Splitter and Voicehandler performed at The Lab in San Francisco on December 5, 2018.